It's that time again, fellow Cardsmiths. The time for villainy to show its dreadful, monstrous, awesome face. Time for the greatest, most devious, most mighty, most wicked and merciless to step forward. Time, I think, for the third incarnation of my design a villain competition! This time we're going back to basics. Design me a villain- give me about a paragraph of lore about their background and history and an awesome, powerful legendary creature card. I'm looking for originality of both story and mechanics- the perfect union of flavour and function. Impress me as you have so many times before! One caveat: No Planeswalkers (They tend to be less flavourful than creatures). 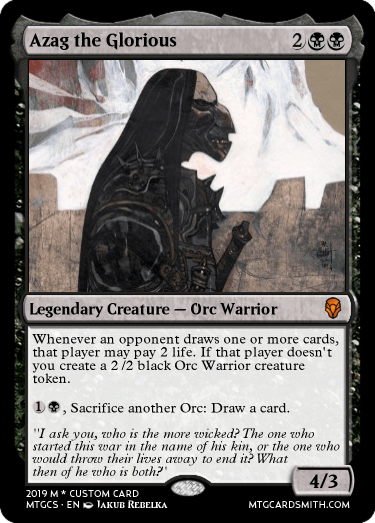 Here's an example: Orc general Azag began his war against humankind after they began to build settlements in orcish ancestral land, turfing out his people. He mustered the orcs into a fighting force and led them into battle against the humans, hoping to drive them away. The war lasted for decades, the orcs saved from extinction only by Azag's tactical brilliance- he starved the humans of resources by cutting off their supply routes. However, as the years passed Azag became less and less concerned with protecting the orcs and more with wiping out every last human- sending his troops on suicidal missions just to eke out a tactical advantage. Titled Azag the glorious, he now sought only renown, and aimed to achieve it through the obliteration of his enemies. Ends 1st February. Any number of entries. Serious entries only. 1st: A follow, 5 favourites and a spot in the hall of fame. 2nd: 4 favourites and a spot in the hall of fame. I don't want to be presumptuous, but I know that in the past @Shadow29870 and @brcien have enjoyed these competitions - plus I believe that @Djayhero and @urtar370 narrowly missed being able to enter the competition's earlier incarnations. Just wanted to let you know this exists! Yes! My encore was heard! In the beginning, there were spirits. Celestials of the void, created by disturbances in the quantum field. They had no purpose, and were constantly in boredom. That is, until a young celestial by the name of Yola started feeling an ambition it never felt before. On its own, Yola devised a plan to create a super-world of immense creativity and inspiration. With the help of its peers, Yola invented the atoms necessary for such world to exist. Together, they built the world from the core out. And thus, the planet of Kithidrantil was formed. Vast plains, lush forests, and monstrous mountains filled the world and excited the celestials. Amazed by its own talents, Yola wanted to take things further- take things its way. It was, unfortunately, only short-lived. In its blindness, Yola invented the black hole. Yola, desperate for help, was left to be sucked into the black hole. Inside the black hole was neither void nor world, but an endless abyss. Yola was driven mad by the absolute silence, and started to hurt itself. It twisted itself in ways celestials were not supposed to maneuver. It ripped at its limbs, letting her cosmic blood ooze out from the wounds. She clawed at her spirit heart, until she was no longer the lively celestial she was. She became death itself, the harbinger of chaos- A dread lord. She gathered all her gained strength while in the abyss, and created a rift from the abyss back into the void. When she arrived, the galaxy was much different. There were no celestials in sight, and it turned out that they manifested themselves into more simpler beings on Kithidrantil- Guardians, they named themselves. Her emotionless vessel started to manifest itself, and entered the world she herself created, only to try and turn it to dust. She now roams the wastes of Kithidrantil, gathering her dread forces to overrun the still pure. Her army will grow, and will one day come out victorious in vanquishing pure life and converting it into dread life. She will consume her dread minions, and self destruct, destroying the planet with her. Could not find the artist, but the art was heavily inspired from Stephen King. Taakul was an troubled human child. Living with his family in a village on a small plane named Triamore. The later it got through his life, the more and more anger he had developed inside him, until one day on his 17th birthday, he killed everyone in his village including him self, with a power he didn't know was inside him. Years and years pass until a demon named Atrakul revived him from the dead. Atrakul gave him powers that he had never seen before. The demon had control over Taakul's thoughts, actions and decisions, until one day, out of no where, Taakul's powers became to strong and takuul overthrew him. Takuul is now to this day killing all in his path with the powers that where given to him by the very demon that resurrected him. You remember Jarina right? Well if yah don't, lemme know. For this is the source of her powers, in a sense. 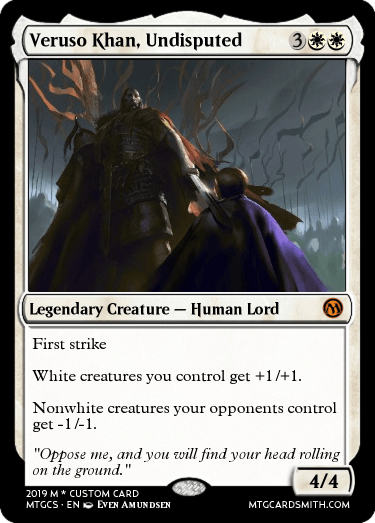 Now... On Lorwyn we have the separate races yes? And the elves wish to keep all out of their forest that they can, for it belongs to them? This was one of their attempts of such. Bargaining a deal, one very reluctant on their half, the elves spoke to the elementals and convinced them in some form or fashion to craft them a guardian for their woods. In due time both sides of the deal were completed, though the elemental being that was handed to their control seemed. . . off. In the midst of its glorious green glow were strands of a sooten ash, flowing through it like blood, the ash of cinders long since decayed. Though at first the Elves ignored this a time came when such was impossible. The ash, corrupted with a cinders fiery hate, changed and shifted the mighty beast. Taking in its surroundings and gaining a conscious of free will it decided that it was, in essence, both life and death in one being. Breaking free of the Elves it trudged into the woods, only to be seen in a flash whenever someone perished, reclaiming them for the forest. 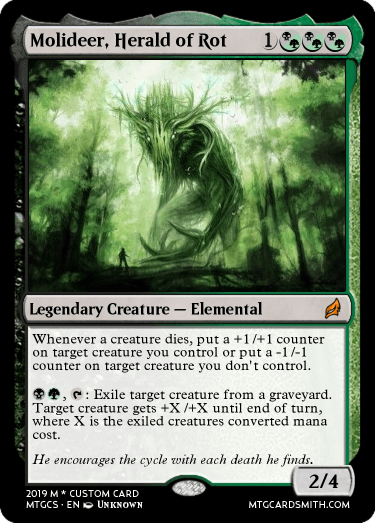 Though it is not clear, the beings of Lorwyn, and several other planes, have noted that whenever someone falls into the forest and resorts to scavenging, much like the story of the Wendigo, they change (though not as drastically). A black 'soot' seems to flow through their veins, the skin they posses (if any) turning a light brown, eyes becoming black. They join Molideer in his journey, becoming living embodiment of the cycle of life and death. I've updated the border on this old card from a set I started a while back... Pandemonium. The Battle of the Western Armies was going to be one of the most Epic battles our world had ever known. After a week in, neither side could claim much, if any, forward momentum. The only thing they could claim was outward expansion, as reinforcements for both sides expanded the field of battle to over three miles long. Both armies knew it was going to be a long and hard fought engagement, but on the seventh day of fighting and reinforcing, the tide of the battle took an unexpected turn. From the Northernmost edge of the battlefield, the fighting suddenly stopped, and soldiers from both sides either stopped in their tracks or ran away screaming. It didn't take long to realize why, as a lone figure walked through this particular valley of death unscathed. The soldiers had heard whispers that they were near a Gorgon nest, but once the fighting had begun the whispers turned silent, until now. Her name was Selenica. 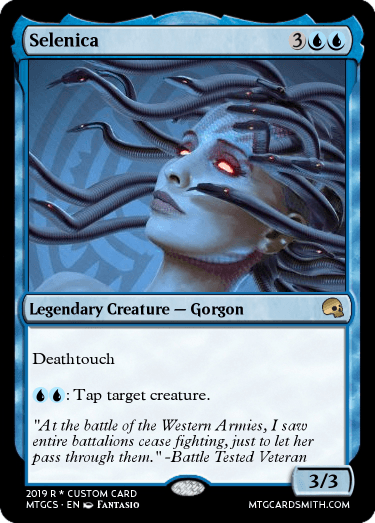 Among the more well known Gorgons of our world, she had garnered a reputation for being relentless and effective. As she walked with singular purpose through the sea of soldiers, those who thought themselves brave caught the flash of her eyes and remained where they stood. Those who could not flee, merely kneeled in place and let her pass. Selenica walked directly through them to the leaders of the Easternmost Western Army. No one who still lives was privy to the conversation that took place when she got there. One man's recount of what he saw that day was this... "There was some talking and then one of them tried to attack the Gorgon. All I seen was her chop that mans head clean off and then more of them Gorgons showed up. We high tailed it out of there and the next day we found out we won the war. I ain't never been back, but I hear there are over a hundred stone soldiers still out there still trying to fight that battle." This is Tikran, a villain that although not using black mana is very sinister. He originates from an unknown plane, built by an evil artifice master known as Stelaar. Stelaar created him as a project, an intelligent construct with its own completely-functioning brain, emotions and all. Tikran awoke in a sewer to a message from his creator and basic knowledge. 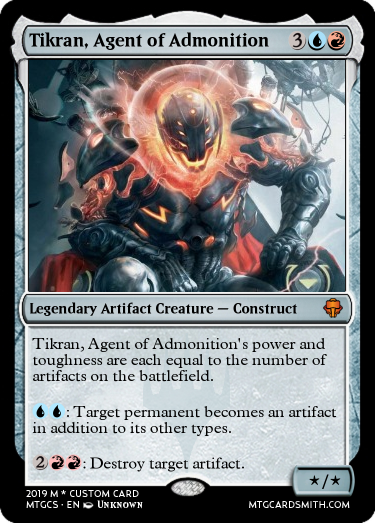 Tikran was made aware of a basic control over metal. He could reshape small metal scraps laying around the sewer with ease. Within about three hours of waking Tikran climbed to the surface. He found himself in a town, in an alleyway. There was a soldier standing at the end of the alleyway. Tikran walked towards him. The soldier turned around, and, startled, thrusted his pike into Tikran's metal core. In retaliation, Tikran reshaped the soldiers armor so that it spiked through his chest, and merged his bracers and boots together so he wouldn't be able to run. From then on, as Tikran began to master his control over metal, he found that every being he encountered feared him and/or tried to scrap or destroy him. Seeing as these mortals were all powerless in comparison to Tikran, he saw them as faulty and unworthy of existence. He unleashed his full might and obliterated his plane of origin. Drifting through the blind eternities, eventually he felt an ignition. He planeswalked to another plane, but the spark disappeared. He blamed his master, Stelaar, for creating him in a world full of disappointments. He unleashes his rage on the multiverse in search of his master, destroying everything in his place, always coming across a new plane, and always removing that plane from the multiverse. i will post a few! Labryst had lost hope when Ir Dullfeather found her. Quickly she fell in love, and saw what the world could be. Love is bliss; bliss is ignorant. Labryst had forgotten herself very quickly when Ir started asking her to do "tasks." Labryst five years ago would feel fear of execution, pain at murder, but not the Labryst who has heard the sweet nothings of the Dullfeather. As Azag made a lot of enemies, one human born from a peasant in the Azmeri empire with seemingly endless determination stood against the ruthless orc. Step by step he rose through the ranks of the army until one day he planned to assassinate the former emperor and took the throne for himself. But of course the promise of power is too great to be swayed aside. One could say that the new emperor is a tyrant, but it was due to the circumstance of the great war that was currently ravaging across the continent, and unluckily the Azmeri empire stood in the middle of it. As an old saying says, you either die a hero, or live long enough to see yourself become the villain. Since he was a teenager, Brunof´s dream was to join the Azorius Senate and help them to keep the order by means of his Robot Automats. The reallity was other for Brunof since he was rejected several times by the Azorius Senate because of his dark uncertain intentions. Acting from his rancor, he claimed vengeance against all the The High Judges represent. Finally found his place beside the mages of the Izzet League who had heard about his desires. The Magewrights saw some destruction potential and anger on him. 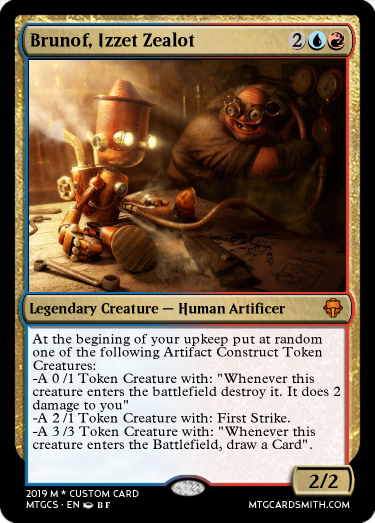 After swearing total loyalti to the Izzet League, soon he started to work under the wing of Melek himself. Brunof is obsesed with automats and robots, which is trying to use with military purposes. This obsesion is not always good as many of his invetions are total failures. As otherwise his death could have been preventable. It almost felt like there was an angry dungeon master. She created him, her best work, and then succumbed to cancer. As he felt such a move would be bold. But for him, it was as entering a new prime! If you don't go to bed soon, he could come after you. 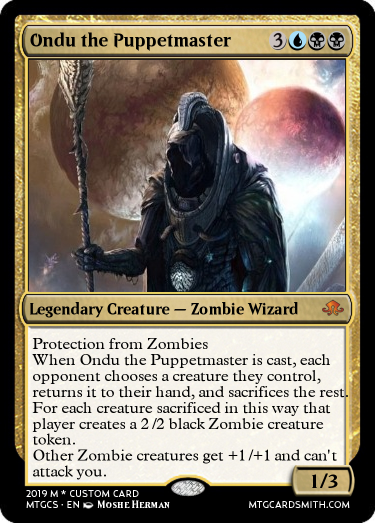 @Undead can we enter creatures that flip into planeswalkers? @Koslen2 That's an interesting one- hadn't thought of it. I'm going to say yes, because there's a creature element there. This villain is Lord Cauldon, a malevolent power-seeker from the plane Fyro. His ambitions were simple - conquest of his home plane. After making a pact with the demon Hiklar, Cauldon's body was bound with Dinjav, a giant volcano known for frequent sacrifices in the name of Hiklar and other demons. 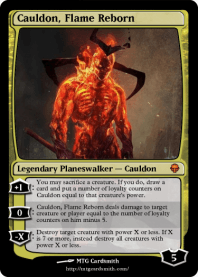 Cauldon could not die in coose range to the mountain, and so he laid in wait, enchancing his mastery over black and red destruction and combat control magic. With his power grew his confidence, and targets for practice became Hiklar's cultists and worshippers that came to Dinjav. Hiklar was made aware of Cauldon's murderous actions, but when he went to confront him, he found himself outmatched. Roles were switched as Cauldon conquered Hiklar and with that half of the plane. 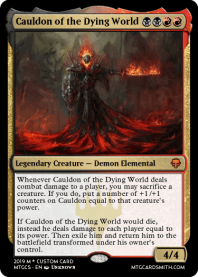 With his new army of enslaved demons, Cauldon went on to conquer the rest of Fyro. Soon after, though, a group of heroes arose to challenge Cauldon. These three were known as Onato, Libyo, and Tigara. 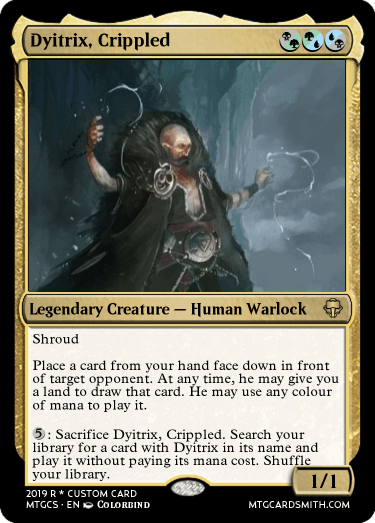 Onato, being the most gifted of the three - although the only one that was not a planeswalker - was left in a stand-off with Cauldon. He stood a chance, too, as Libyo sacrificed a portion of his power to severely cripple the mighty Cauldon's power. Then evenly matched, with their swords they struck each other at the same time - or would have. They both discovered the spark inside them as they ignited. Cauldon found himself on a plane full of life, flourished with civilization and peace. Naturally, he took no time to burn it down, taking the life force of the world to reignite his flame of power. He now searches through the multiverse for the three that almost ruined him, and he won't stop until Onato and the others turn to ash beneath his feet. Nightmaw was once summoned by an aspiring necromancer, who stumbled upon a dead dragon and brought it to life. The Dragon, however, was not thankful. Nightmaw was slain for a reason. It's glaring eyes brought a shiver down the necromancer's spine, and she was eaten alive. Nightmaw let out a piercing roar that shook the earth and trembled in the sky. It was time for revenge. Since then, Nightmaw has slain seven armies and resurrected them to do it's bidding. It resides on top of the tallest mountain and sits on a throne of bones. It's armies have yet to suffer a victory, and many kingdoms have fallen to their knees. Nightmaw may have been resurrected, but there is no salvation for anyone else. Kinda late to the party, but this took a long time to make. Welcome, to the world of Triedge. 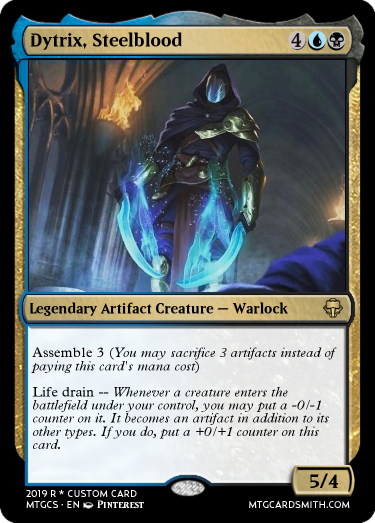 It is similar to a shard of Alara, in the way that it lost 2 of its colours, but unlike Alara, this happened on the opposite edge of the multiverse. So no Nicol Bolas meddling, no conflux, no nothing. The plane just drifted more and more into madness and void, away from ever regaining red or white again. Amidst all this, stands Dytrix Ken, Governor Supreme. While viewed as a villain by the common folk, and especially by the cult of Mandatori-Forda-Kontast, some view him as a great bringer of peace. That is, before the Rebirth, but we are getting ahead of ourselves. Dytrix Ken stands on a cliff, and gazes into the distance. He was born in the Capitol, a middle area that linked the lands of black and green Guglarziexians, the blue and black Dimilumgar, and the blue and green Merkiorimics. This is the place where the very few decisions that affect all 3 realms and keep the fragile peace are made. Except time. Time is ticking away. The years in the political heat have withered away at his strength. He recently moved to the seaside, and relocated most of his power to the rest of his council, but nothing can change it. His time is up. See, aside from being a great politician, he is a brilliant inventor. It is done. It is complete. He grew a new body, golem, suit, machine, whatever. Didn't matter then, matters even less now. There was just 1 part missing. A grenver crystal. Except there is something wrong. The assistant was a spy. For whom? THIS IS WHERE THE TIMELINE SPLITS! The blue-green sneaked in a crystal of their own making, but conditioned to look like a pure one. 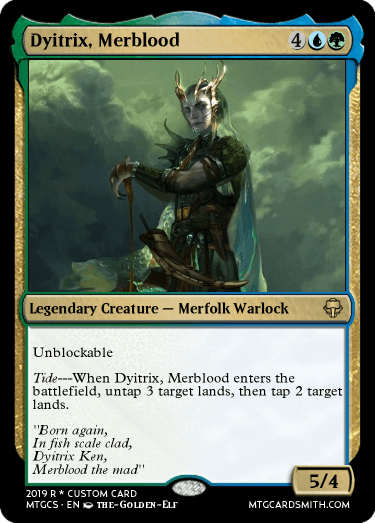 And when the transformation is complete, Dytrix morphs into a merfolk-like form. Immediately, with the support of the capitol, the Merkiorimics take over the land, flooding it, transforming it into an ocean world littered with archipelagos, where the other races live untouched by him, but constantly damaged by nature, under Dyitrix, Merblood. The black-green sneaked in a crystal of their own making, but conditioned to look like a pure one. 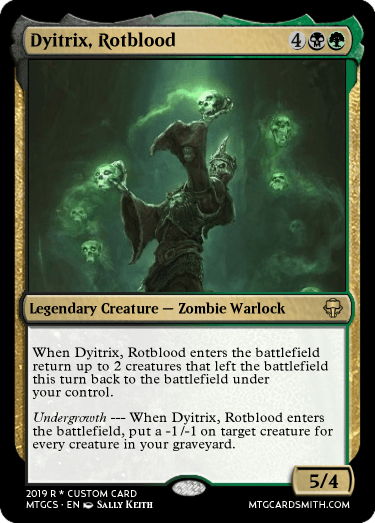 And when the transformation is complete, Dytrix morphs into a lych-like form. 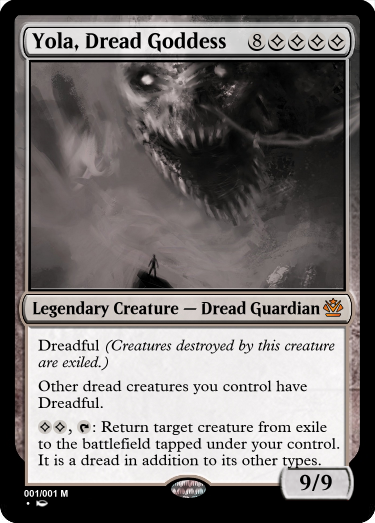 Immediately, with the support of the capitol, the Guglarziexians take over the land, razing it, transforming it into a hellscape where the undead roam, where the other races make up feasts for the undead (think Innistrad, but worse), under Dyitrix, Rotblood. The black-blue sneaked in a crystal of their own making, but conditioned to look like a pure one. And when the transformation is complete, Dytrix morphs into an automaton-like form. Immediately, with the support of the capitol, the Guglarziexians take over the land, destroying nature in favour of cities, transforming it into a metropolis akin to Ravnica where the council induces fear, and everyone complies to the new regime, under Dyitrix, Steelblood. This contest is now closed for judging! Stay tuned for the results. Sorry for the delay everyone, judging will be as soon as possible. Don't worry, take your time. Dytrix always takes his time.